Oil-producing countries were shocked when the commodity plummeted from more than $100 per barrel in 2014 to $27 a barrel in January 2016. Saudi Arabia and Russia called a meeting of oil-producing nations in Vienna—even though Russia is not a member of the Organization of Petroleum Exporting Countries—and agreed to stabilize prices. Robert McNally, president of the Rapidan Group consulting firm in Washington, says Saudi Arabia’s goal was straightforward: “to get off the global oil roller coaster … cut production and try to act as the swing producer” (a supplier with the capacity and power to determine market prices), in order to bring some stability at a viable price. The Vienna Group (as McNally dubs it) may have been too effective. As Brent crude approached $80 a barrel in May, a report by UBS warned that oil was outside a “sweet spot” of $50 to $70 where it contributes to global growth. What are the implications for the global economy, emerging markets, the oil industry, renewables or electric vehicles (EVs)? 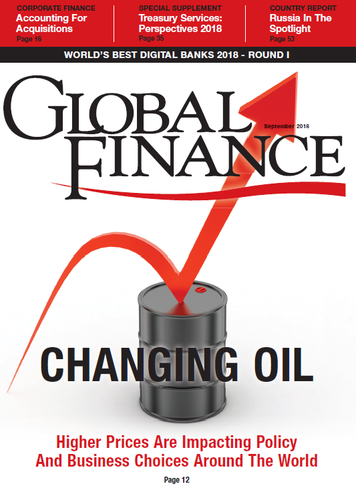 Might oil decide the fate of all? 1. Is the global economy at risk? There’s little consensus about the overall economic impact. UBS analysts say that if oil hits $100, global growth would slow and inflation would rise. In the US, UBS points out, “oil spikes preceded five of the last six recessions.” The country’s current status as the world’s largest producer (due to the shale bonanza) gives it little protection: Its car culture, small oil sector relative to the economy, and pipeline-capacity constraints mean the net impact of higher prices would still be negative. Subbaraman believes a sustained oil shock—lasting for several months—would add to pressures on growth at a dangerous time for the world economy. At the least, rising oil prices make it harder for central banks to gauge inflation, raising the chances of an error that could unleash inflation or undercut growth. 2. How will emerging markets react? Oil’s cost matters more in emerging markets than developed markets, explains Rabah Arezki, chief economist for the Middle East and North Africa at the World Bank in Washington, DC. “Developed-market economies tend to be more focused on services and are therefore less exposed to the impact of high oil prices,” he notes. Emerging-market countries are both more energy intensive and less energy efficient. Arezki argues that countries should favor “a targeted social security system, independent of oil prices,” over subsidies, because it is fairer and more economically beneficial. Egypt has introduced targeted transfers aimed at the poorest, salary bonuses for public-sector employees and pension increases aimed at the middle class. So far, China and India have also resisted pressure to reverse subsidy reductions, notes Arezki. There are simply too many factors—political, economic and social, and both domestic and international—to make concrete predictions about impacts due specifically to an oil-price rally. 4. Should the industry be partying? Nevertheless, when prices collapsed, every capital project that could be stopped was stopped, recalls Nyquist. As prices started rising in 2017, capital expenditures (capex) increased; but the pace of growth has not accelerated with the recent price bump. “That’s because many believe that today’s prices are being driven by geopolitical concerns, such as Venezuela and Iran, rather than fundamentals,” he says. “In addition, the independent sector in the US has built a reputation for consuming cash and chasing growth.” Nyquist predicts that capex will grow at around 5% a year in the medium term. 5. Is this a tipping point for electric vehicles? Nyquist says EVs are 10-15 years behind solar and wind in terms of economic viability and still rely on big subsidies. “Some West Coast pundits predict EVs will constitute 90% of the auto market by 2030. We don’t see that,” he adds. The International Energy Agency expects EVs to displace 2.5 million barrels per day (bpd) by 2030. In 2017 the US used nearly 20 million bpd, according to the US Energy Information Administration. Hence, the industry is skeptical that oil will be replaced in transportation any time soon. “They play along largely to ensure they stay in good graces with governments and society; they don’t want to be the skunk at the party,” McNally explains. There have been other alternative fuels in transport, including electric and alcohol, but oil delivers affordable, scalable transport. “When that happens with electric vehicles, they will be successful,” says McNally. Of course, while oil-price volatility could herald an EV dawn, it would also have serious macroeconomic and geopolitical consequences. Whatever happens, oil will continue to drive the world for the foreseeable future.